Accessible Horizon: Bharathanatyam Indian Classical dance! How many of us actually know about folk dances that exist in different countries?? well, to start with i thought i'd introduce myself and you all to some of the Indian and the other folk dances in the world. Let's start with Bharatnatyam, which originates from TamilNadu..thanks to the internet..i don't have to keep researching a lot..i can give you and idea and you could check it out for yourself if you are interested in any one of these art forms!! 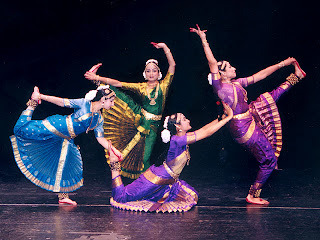 Bharatanatyam is a classical dance form originating from Tamil Nadu, a state in Southern India. This popular South Indian dance form called Bharatanatyam is a 20th century reconstruction of Cathir, the art of temple dancers. Cathir in turn, is derived from ancient dance forms. The word Bharata, some believe, signifies the author of the famous Sanskrit treatise on stagecraft, called NatyaShastra, and the word Bharatanatyam is sometimes given a folk etymology as follows:Bha for Bhava or abhinaya and expression, Ra for raga or melody, and Ta for tala or rhythm.